The OPC-PRT2 communication interface provides PROFINET IO connectivity to Fuji FRENIC-MEGA and FRENIC-HVAC adjustable speed drives. MRP (Media Redundancy Protocol) allows for fast recovery and high availability. Dual RJ-45 ports with embedded IEEE 802.3 10BASE-T/100BASE-TX Ethernet switch supports star, daisy-chain, and redundant ring topologies. Shielded RJ-45 connectors accept standard CAT5-type 8-conductor unshielded twisted-pair (UTP) patch cables. MDI/MDI-X auto-crossover allows the use of any combination of straight-through and cross-over Ethernet cables. The Configuration Studio software reduces the user's learning curve. 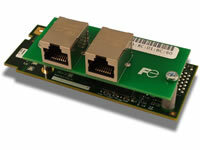 Easily discover, configure, and update units via USB and Ethernet. USB 2.0 port with mini-B connector provides composite USB device functionality. USB connection allows for product identification, configuration, and firmware updating. Enumerates as a standard USB mass storage device ("flash drive") for configuration and web page customization. Remote configuration, web server content, and firmware updating. Remote access to the unit's file system. As new firmware becomes available, the unit can be upgraded in the field by the end-user. Open XML-based socket data transfer allows end users to create their own custom web server content and load it onto the unit's internal file system. The factory-default web server provides real-time inverter function code monitoring/control via standard web browsers such as Microsoft Internet Explorer and Mozilla Firefox. A variety of gauges, meters, and graphs can be configured to provide an at-a-glance graphical overview of critical application variables in real-time. A total of ten gauge windows are available (two at a time) and each gauge window can be configured to display one of six different gauge types. A virtual keypad interface provides quick access to control and monitor information. A configurable network timeout action can be programmed that allows function codes to have their own unique "fail-safe" conditions in the event of a network interruption. 1 bicolor red/green module status LED. 1 bicolor red/green network status LED. 2 bicolor red/green Ethernet LEDs.